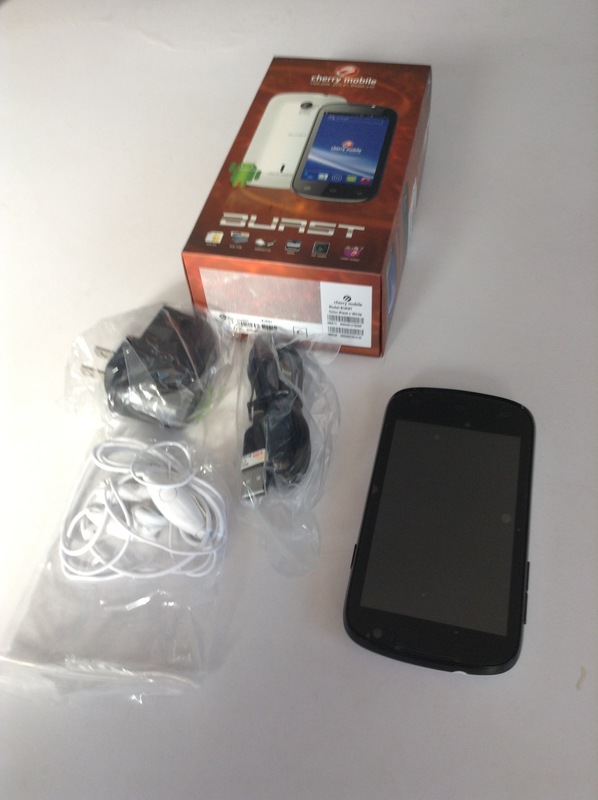 REVIEW: Cherry Mobile S280 Burst | iStoryang HaaayTek! If you can’t get a Flare, try the BURST. That’s exactly what i am doing. I have subscribed to Sun Cellular’s Regular Plan 350, at first, with the intention of getting the Flare unit free of charge. But as always the Flare is rare to catch nowadays. 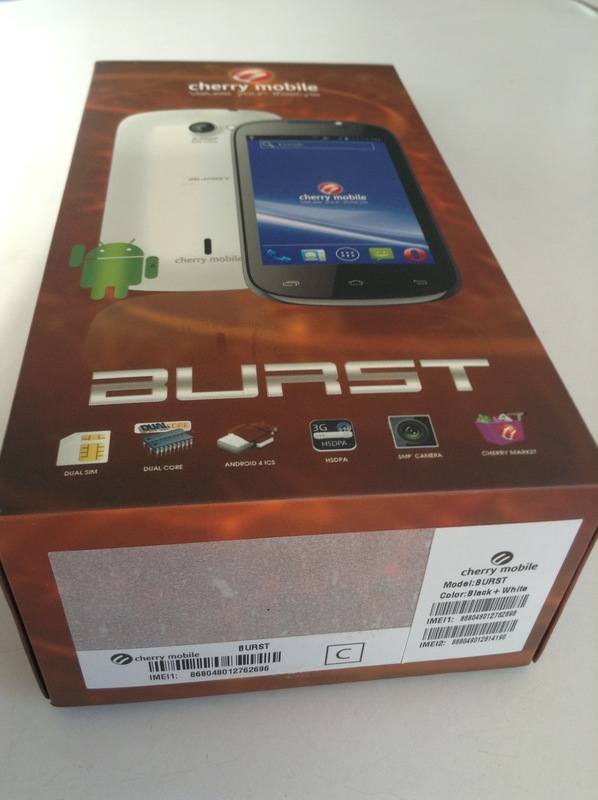 So, i opted the Burst device, also from local brand marketer-Cherry Mobile. The Burst has almost the same specs with the Flare, including the price (P3,999), as i’d told you earlier here in my blog. The only differences are illustrated in the table below. Since i haven’t tried the Flare, i will base my comparison with some existing reviews of the Flare by other reviewers. Also, i’ll make a differentiation with the much bigger unit- the Cherry Mobile Titan that i had reviewed here. The Burst is about the same size as the Flare but its back cover is made of a glossy plastic unlike the semi-matte finish of the Flare. It has only one variant, with black body and a white back cover. The front is covered with plastic all over. On its top are the front camera, the proximity sensor, and the earpiece. Below the front panel are the usual capacitive Menu, Home, and Back buttons. The Burst has a clean design with nothing on its sides but the Volume rocker on the left side and the Power/Sleep button on the right.The microphone is discreetly found just below the Back button on the front. The USB port is at the bottom while the 3.5mm earphone jack is at the top. Since it’s mostly made of plastic, the Burst is very light but comfortable in your hands because of the convex design of its back cover. Unlike the Flare, the Burst is more curve/round on its corners. It’s lightweight and comfortable both in your hands and pocket, unlike the Titan which is heavier. The Burst has the same screen resolution as the Flare and the Titan. However, like the Flare, the Burst has a denser screen than the 5-inch display of the Titan. It has 240dpi. In short, its display is better than the Titan. However, the display is not as bright as the Titan. The touch panel of the Burst is only two-point touch. However the screen is responsive of the tap, swipe, drag, and pinch. The Burst has also a 5MP rear camera which is now the minimum for smartphones, capable of at most 2592 x 1944 images. Though, its front camera still sports the inferior 0.3MP VGA camera capable of only 640 x 480 resolution. The picture size can be set at QCIF, QVGA, CIF, VGA, WVGA, SVGA, 1MP, HD720, WXGA, 1.3MP, 2MP, 3MP and 5MP. Check some samples below with settings at optimum to reflect the best images that this phone are capable of. Video Recording in Burst is not good and way behind Titan’s video recording. Since the unit i have is locked to Sun and only the SIM 1 is a 3G slot, so i am left with the measly Sun Cellular signal. I had to wait for several minutes of buffering before i could watch a video stream from YouTube. The Burst is louder than the Titan because of the convex back cover that serves as its sound box. Though, the sound quality still lacks the deep bass. The treble sounds better than the Titan. The earphone sounds like an average earpiece without the bass. The sound experiences are the same whether it’s playing via the music player or the FM radio. One thing good with the Burst is a good earpiece sound during calls. It’s much better and clearer than the Titan. The Burst has a different and improved UI than the Titan. Notifications pop up on the screen like in the left-most image below. This makes the user interactions immediate. Additional local apps are now present in the Burst like the Kabayan, Cherry Market, Cherry Fun Club, and eWArranty. The eWarranty app allows the first-time user of the phone to register the phone to Cherry Mobile by sending MMS message and therefore eliminates the need to fill-up the Warranty Card which has to be sent via mail to avail of the warranty in the future. One thing good with the Burst is the Qualcomm’s Snapdragon 1GHz Dual-core processor on it just like the Flare. It’s seldom for a China-made phone to sport a Snapdragon. The generic China phones and even the Lenovo phones are opting the cheaper MediaTek chips. This phone is a little slower than the Titan. It boots at more than 10 seconds unlike the Titan which can be turned on in just about 8 seconds. Tethering of the Burst is fine when i made the draft of this post on the iPad mini connected via the former’s hotspot. But again uploading is dependent of the Sun’s data speed which is on the average-sluggish in several areas in Metro Manila. You can choose either WiFi Tethering or the Bluetooth Tethering which consumes less power of the battery. However, you can only connect one device at a single time in Bluetooth Tethering unlike in WiFi Tethering which can carry up to five devices. The benchmark tests using the AnTuTu Benchmark scores the Burst at 5757 which places the Burst at the bottom in the same category that is being topped by Samsung Galaxy SIV. The Quadrant Standard test is at 2745 (other test done by other reviewer of Flare is at 2932), and the NenaMark2 Test gauges the Qualcomm Andreno (TM) 203 GPU at 27.9fps which is a little better than the Titan (27.3fps). I also tried running the AnTuTu Stability Test on the Burst which shows some changes in the curve as shown in the screenshot below. The biggest change is when it drops to about 25 on the scale. This is far below the Titan’s stability test which shows a more stable readings. Temperature test on the Burst is constant all through out at 32. The Burst is an ideal replacement of the Flare if you can’t get the latter. In few days that i tested the Burst, there was no issue that i had encountered except that i’d noticed the battery life is shorter when you connect it to 3G while turning on the WiFi Tethering at the same time. In my test, it consumes 50% of the battery in just an hour. Though, you can find a remedy here by using the Bluetooth Tethering instead to save power. wala pong SYSTEM UPDATE ang CM BURST 280 KO!! PWEDE KO PA BANG IUPGRADE ANG OS NITO KASE NAPAKABAGAL NG PERFORMANCE NYA EHHHH!!! Cellphone repair shops but it’s very limited. Hello 🙂 may tanong lang po ako. ano po bang pwedeng gawin to boost up the performance of my burst s280. 2 times na akong nag reset but ganun prin sya kabagal. Hindi na nga ako nagdownload ng apps eh. The capability of the phone is limited. Others are rooting their unit to uninstall some pre-installed apps but i won’t recommend rooting. You may just disable some needless apps to stop it working in the background. burst s280 phone ko. kakabili ko lng last mos. the problem is hindi ako marinig ng kausap ko. walang lumalabas n voice kahit d nman nakamute ang microphone ng cp. pano po b ‘to? Possibly sira yan. Have it checked with CM Service Center. paano po ireformat ang burst ? lage po kase sya nag hahang . hnd q ma activate ang 3g gprs s globe network kht nsa slot 1 p xa pero s smart pde nmn… pano poh b eto? Check NETWORK USE FOR DATA. baka hindi naka-select sa Globe. you don’t have the dimensions…!! !